It was to be a landmark university-corporate research partnership: Novartis, a Swiss-based pharmaceutical conglomerate, would pay $25 million over five years to the University of California at Berkeley. But what the company was to get in return shocked faculty, students, and outsiders alike. In exchange for funding, Novartis would be allowed to sift through the research of the department of plant and microbial biology at Berkeley's College of Natural Resources - licensing up to about one-third of the researchers' output. Students declared it a sellout. Legislators scheduled hearings. Professors protested the secrecy of the negotiations. One professor decried the deal for creating an "apartheid" of have and have-not faculty. Outside observers were no less impassioned. "What if the [Novartis-Berkeley] experiment were to succeed?" wrote Robert Rosenzweig, former president of the Association of American Universities, in response to the deal. "What would be the next part of the university to be sold to a corporation?" Portending the turmoil to come, company and university officials announcing the November 1998 deal at a press conference had to duck to avoid being hit by a pie. Despite protests, the deal went through, and administrators report that it is working. Yet misgivings persist. "This is a public university that is supposed to work for all sectors of society," says Miguel Altieri, associate professor at Berkeley. "Obviously the sectors we're going to be working for in the future are the ones that bring in the money." Such comments only hint at the vortexes created by university-corporate partnerships. Critics cite fears over limits on academic freedom, conflicts of interest among researchers, and bias creeping into scientific research. Over the long run, observers also worry that research priorities might shift away from breaking scientific ground to more short-term, product-related efforts. And there is the possibility, too, that the public will lose confidence in higher-education research. Nelson Kiang, professor emeritus at the Massachusetts Institute of Technology, has watched the changes during his long career. What's different today is that "the sheer number of corporations involved in sponsoring research has exploded," he says. "The ethos of the university is the free exchange of ideas. Now we're running into two sets of ideas from two cultures. When they start to interact intimately, accommodations have to be made. At the moment, there's no agreed upon way to do that." Acknowledging a deep divide between corporate America and American universities, a two-year study issued last week by the Business-Higher Education Forum - a partnership between the American Council on Education and the National Alliance of Business - outlined problems and recommendations for smoothing the rocky road between the two worlds. "Some research collaborations have experienced serious, high-profile difficulties," stated Hank McKinell, chairman of the board of the New York-based pharmaceutical company Pfizer and co-chair of the report task force. "The report is intended to help clarify the issues." One such issue is academic freedom. Corporate and academic priorities clash when scientists want to share research discoveries, but contracts often require secrecy for 30 to 90 days or longer while patents are weighed. Betty Dong at the University of California, San Francisco, discovered data that led her to question the effectiveness of a medication being used daily by millions of people. But when she went to report it, she was blocked for seven years by the company that paid for the study. David Kahn, another researcher at the same school, was sued last November for $10 million by the company that sponsored his study, after he published a report that the AIDS drug he was testing was ineffective. "They're like bullies in a sandbox who take away their toys when you don't agree with them," Dr. Kahn told The Chronicle of Higher Education. Few foresaw these clashes two decades ago. Such research partnerships had long been a staple of American higher education, going all the way back to the 1862 federal legislation that created the land-grant university. But university research started melding with the business world at a much faster pace with the 1980 passage of the Bayh-Dole Act. Bayh-Dole sped up the patenting process for university research, supercharging university-corporate partnerships with profits and competition. In the 1970s, just a few hundred patents resulted from university research each year. But in fiscal 1999, more than 120 US research universities filed a total of 7,612 patent applications, according to the Association of University Technology Managers. Licenses to industry generated $641 million in gross income for the universities - and about $40 billion in economic activity overall. "You used to have big corporations with labs that would do their own basic research," Mr. Kiang says. "But ... it's much more effective to turn the universities into R & D labs for them. By sprinkling money around ... they don't have to compete for the best brains in the academic world, they simply buy them at low cost." The federal government is still by far the dominant funding source for university research. In 1998, corporations were responsible for less than 8 percent of the funding. That may not sound like much, but it represents a seven-fold growth since 1970. According to the new report, the flood of patents has been a big boost to America's increasingly knowledge-based economy. Federal Reserve Chairman Alan Greenspan told governors last year: "The payoffs, in terms of the flow of expertise, new products, and startup companies ... have been impressive." Indeed, for every challenged program like the Novartis-Berkeley union, the Business-Higher Education Forum report documents other collaborations that are working well. At Washington University in St. Louis, for instance, a funding deal with Monsanto (now Pharmacia) has been harmoniously in place for two decades. Smaller companies have prospered, too. Ribozyme Pharmaceuticals gave the University of Colorado a five-year, $500,000 unrestricted research grant. In return, the university shared research that helped the company grow. Despite this robust productivity, some fear that a key product of universities - unbiased research - is at risk. In some fields, especially medical research, scientists complain that corporate cash appears to be undermining the credibility of research results. In 1996, Tufts researcher Sheldon Krimsky studied nearly 800 scientific papers published in prominent biology and medical journals. In 1 out of 3 cases, he found that a chief author of the paper had a financial interest in the company for which research was being done. In most cases, the connections were not disclosed to readers. Mildred Cho, a senior research scholar at the Center for Biomedical Ethics at Stanford University, took a different tack. Her 1996 study found that 98 percent of university studies of new drug therapies funded by the pharmaceutical industry reported that those new therapies were more effective than standard drugs. By comparison, just 79 percent of studies without industry financing found the new drugs to be more effective. Other researchers are disquieted, too. "There has been in some fields a substantial, industrial-commercial influence," says David Blumenthal, director of Massachusetts General Hospital's Institute for Health Policy and a professor at Harvard Medical School. In a 1998 study, he and colleagues found that 43 percent of scientists - many of them at university medical centers or schools - had received at least one research-related gift. About two-thirds said the gift had been important to their research. Such conflicts are hardly confined to the medical field. In his 1997 book, "The Heat Is On," Ross Gelbspan cites professors for not disclosing that coal and oil companies had funded their studies, which were used to undercut arguments in favor of reducing greenhouse gases. Meanwhile, back at Berkeley, the Novartis funding is winning converts. Despite what one university official described as "lingering resentment," only two of 31 faculty members in the Berkeley department have declined to seek grants ranging from $60,000 to $200,000 to fund their research, according to the just issued report. Will the scientists who do accept corporate funding disclose that information when they publish their research? Pressure has been building at the federal level for tough new disclosure requirements since the 1999 death of Jesse Gelsinger, a teenage volunteer in the clinical trial of a gene-therapy drug at the University of Pennsylvania. In that case, a researcher had a financial interest in the drug's success. (The death this month of a volunteer in a Johns Hopkins University asthma study is being investigated, but no information has surfaced suggesting any conflict of interest in that federally funded study). At a meeting last fall, scientists debated whether and how much to disclose about such interests to potential patient volunteers, but could not agree. Researchers receiving federal grants must disclose any income greater than $10,000 from a corporation. But that rule does not apply when companies do all the funding. And even when scientists do report, it is usually only to the university itself, which often does not disclose such financial ties. One ray of hope: The New England Journal of Medicine recently admitted that it had failed to disclose 19 authors' conflicts of interest - and toughened its disclosure policy. More disclosure at all levels is needed, Dr. Blumenthal argues. The long-term risk, he says, is nothing less than a loss of public confidence that could permanently undermine support for universities. "There is a need for guidelines and protections to assure the public that commercial motives are not excessive," he says. "It won't be hard to do that if we could get the universities to take the long view.... But in the heat of battle, it's hard to do." NOTICE: In accordance with Title 17 U.S.C. Section 107, this material is distributed without profit to those who have expressed a prior interest in receiving the included information for research and educational purposes. Feel free to distribute widely but PLEASE acknowledge the original source. A controversial financial partnership between a private company and a public university appears to be ending, falling victim to a slumping biotechnology sector. The five-year, $25 million deal between biotechnology giant Syngenta International A.G. and the University of California, Berkeley, will expire next November. But a deadline to renew the deal passed last month without the school hearing from the company. School officials speculate that since the deadline passed without formal word from the Swiss company, the deal -- as it is written today -- will expire without renewal next year. Fueling that belief is the fact that Syngenta is in the same choppy financial waters as the rest of the agriculture biotechnology industry. The company is shuttering its San Diego-based Torrey Mesa Research Institute, which oversaw the deal. The sector has been particularly hard hit by the overall economic downturn and increasing opposition to its genetically modified food products. On Wednesday, the chief executive of Syngenta competitor Monsanto Co. resigned amid sagging sales and the company's inability to shake its financial struggles. Syngenta spokeswoman Lori Captain said that while the economy was tough, the school's speculation still surprised the company. "There's been no decision," Captain said. The contract calls for Syngenta to annually pay $5 million to the Department of Plant and Microbial Biology at Berkeley. In return, the company can license inventions created by many of the department's scientists. The first-of-its-kind deal polarized the campus and was intensely criticized by some when it was struck on Nov. 23, 1998. Some welcomed the money as a godsend that has brought their research to a higher level; others saw it as selling a college department to private industry. So far, Syngenta has the option to license one university invention. "We are pleased to date with the results," Captain said. School officials also said the deal can't be judged solely on a single license. Basic research today could lead to blockbuster products five years from now, they said. "It's premature to judge whether the deal was or wasn't successful for the company," said Susan Jenkins, Berkeley's administrator of the partnership. But Jenkins said the school views its end of the deal as a success. The Syngenta money allowed its researchers to engage in high-risk experiments that would not have been funded through government grants. Data from some of those experiments is now being used to successfully apply for government grants, money that Jenkins said would help offset the loss of Syngenta money. Jenkins said the school is confident it will be able to overcome the loss through other funding sources if the deal is not renewed. She also said the school hopes that researchers will be able to secure individual grants from the company. "We are not cutting back at all," she said. In recent years, many universities have thrived on their relationships with industry. In the sciences, academics and their institutions have benefited from contracts, donations and sponsorship, and from the entrepreneurialism of faculty members - a trait now encouraged by government in most scientifically developed countries. Nowhere is this more so than on the west coast of the United States. One third of all the world's biotechnology companies were founded by faculty members of the University of California. The benefits to researchers and universities are many. They include access to industry facilities and databases, financial support for research that can help the university as well as the company, opportunities for academics to tap into the market's expertise, and the longer-term benefits of experience and contacts. The downside - for academia at least - of these benefits is becoming increasingly clear. Some of the problems arise in the scientific literature. Recent publications in biomedical journals indicate that researchers sponsored by companies are biased in favour of reporting positive experimental results relating to company products. Undeclared conflicts of interest have occasionally undermined trust in published research and reviews. Other difficulties arise if companies try to restrict academic freedoms or institutionalize industry's influence. For example, in at least one contract offered to a prestigious university by a multinational chemical company, the company took ownership and rights over all data deposited in their database. The academic involved found the company inflexible on this issue and so withdrew. One controversial example of industrial influence is the deal between the University of California at Berkeley and Novartis. The company is paying about $5 million per year for plant research and providing access to its databases; in return, it gains a seat in university and departmental research committees and restricts academics' freedom to discuss the benefits of the deal. Some students and academics are protesting against the agreement, claiming it undermines Berkeley's status as a publicly funded and publicly accountable institution. Anti-corporatism vs anti-liberalism Protests against over-intimate industrial ties are not restricted to Berkeley. Young biologists at a meeting on genetics and society organized by the European Commission lamented their universities' increasing dependence on industrial funding, and one patients' group attacked another for its links to a pharmaceutical company. Such protests can be seen as the more informed end of the grouping known as the post-Seattle movement. This movement represents an active unease within society: that global corporations have too much unaccountable influence on institutions - including universities - that are meant to act in the public interest. The Novartis-Berkeley;deal can all too easily be portrayed as an institution undermining both its motivation and trustworthiness to provide an independent and impartial view of one of the most contentious technologies of our time - genetically modified crops. Although it is unusual in its scope, other universities will recognize the issues it raises. The chancellor of Berkeley, Robert Berdahl, although standing by the Novartis deal, has expressed his own unease at what he calls the privatization of the public universities. In a recent speech he highlighted two forces that are changing the environment for public universities in the United States: declining public funds, and a systematic, successful and entirely legitimate campaign to develop an anti-liberal, right-wing agenda in universities. These two forces, he implies, are stimulating the growth of the university-industrial complex. And the dangers? Loss of cohesion at the university due to salary differentials and market forces; a downgrading of humanities - while the technology-related ethical and social issues that they should address are burgeoning - and a loss of academic objectivity and consideration of the wider world. New year's resolutions: So what resolutions are required to maintain public trust in higher education and publicly funded research? - Vigilance and the ability and determination to speak out. Caught between anti-corporatism and anti-liberalism, academics have to stand up for themselves, with the protection of university constitutions and hierarchies. - Transparency over conflicts of commitment. There is, for example, a need to prevent the valuable findings of government-funded students and postdocs being inappropriately funnelled into commercial ventures. This could prevent timely publication and lead to commercial ownership of a discovery that was made using public money. There should be limits on, and disclosure of, involvement of faculty members and others in companies. - The issues need to be debated and dangers highlighted at a national level. In this respect the imminent inquiry into university-industrial links by the US national academies' committee on science, engineering and public policy is timely. - Industry must help sustain public trust. Some companies approach universities and the knowledge they produce in a way that can be best described as predatory. Occasionally this may yield short-term returns, but public distrust of research can have a powerful impact on regulation and on consumers. Are Agro-Giants Taking Over University Research? Biotech companies are threatening our food supply. These agro-giants are plundering our public research programs and the nation's land-grant universities, which were established to promote science in the public interest. All of this in the name of short-term profit. The U.S. Supreme Court appears to be backing this trend, with its recent decision to protect the patent rights of agriculture giants like Monsanto and Dupont over new varieties of seed the companies develop. The decision weakened farmers' rights to save seeds from their own harvest for future crops, forcing farmers to buy new seeds from the companies each year. Taking power away from farmers and giving it to corporations is dangerous. Industry experts claim biotechnology will save the world, that it will end starvation and cure malnutrition. They say it will save the environment by reducing the chemicals required to grow our food. But that's not really what biotech is about. Biotech is about ownership. It's about who has the rights to profit from the ideas and techniques that emerge from a shared public scientific heritage. It's also about profiting from the genes and genetic makeup of living beings. And these corporations are using our public universities to do their research, to increase their profits, and to diminish farmer and consumer rights. Land-grant universities were established more than a century ago, with federal funds, to promote research in agriculture, engineering and other areas. Crop and livestock breeding programs flourished under these research programs. The purpose was to develop varieties of plants and animals that would benefit farmers and consumers both financially and nutritionally, and ultimately benefit society at large. But in recent decades, the public-interest mission has almost disappeared, replaced by service to corporate interests. This is especially true in corn and soybean research. The bulk of remaining public programs until recently were in wheat breeding. Today essentially all public wheat breeding programs nationwide have partnerships with transnational chemical company BASF. And the University of Idaho, North Dakota State University, the University of Minnesota and Oregon State University have gone public with their agreements with Monsanto to produce herbicide resistant wheat. Wheat, the world's principle calorie source, is one of the few major crop plants still in the control of farmers. Unlike corn and soybean farmers, the majority of wheat farmers still plant the seed they harvested the previous season. They also trade seed and even select types from the fields that do best in their particular geographical area. Most of the 60 million acres of wheat in the United States are still planted with varieties that were provided by land-grant universities with few or no legal strings attached. This means that a farmer who is happy with the type of wheat he is growing has every right to save the seed and plant it back the following year or sell some to a neighbor. The biotech seed industry stands to make hundreds of millions of dollars annually if it can gain control of the wheat seed. How can biotech corporations force wheat farmers to buy seed from them every year? First they need proprietary genes, then a plant to put the genes into. Then they need laws that protect their investment. All of these items are in place. Corporations have quietly and increasingly established partner relationships with land-grant institutions. The most common proprietary genes in crop plants are for herbicide, or weed killer, resistance. What is the value of a gene that protects a plant from your patented herbicide? Nothing -- until you put it into a crop plant that suffers from weed infestations. Once the gene is in a crop plant, it is worth an additional $5 to $50 per bag of seed. In addition, the farmer is required to sign a contract saying he will not save or plant back any seed the following year. As a bonus, the company with the herbicide resistance gene also holds the patent on the herbicide that the farmer uses. Where does a company get a wheat plant in which its scientists can put their gene? The obvious answer is the universities; they hold tried and true wheat varieties, each specifically adapted to particular local conditions. In a state like Washington, over 95 percent of the 2.5 million acres of wheat is planted with university bred varieties. Breeding a single new variety of wheat takes up to 15 years and existing varieties are constantly being updated and replaced. To start a breeding program from scratch is not only expensive but time-prohibitive. Corporations have quietly and increasingly established partner relationships with land grant institutions. This way they capitalize on a university's infrastructure, its equipment, the material in its breeding programs, the expertise of its students and professors, and the tradition of trust established with the farmers. Now, nearly all of the land grant universities have flung open their doors to corporate control of their wheat breeding programs, signing confidential agreements with chemical companies Monsanto and BASF to put their genes into public varieties. The outcome will be wheat varieties sold by universities in partnership with corporations. Farmers will pay extra for what used to be free, and the public will be buying wheat products that have been genetically modified for the specific purpose of gaining ownership. Farmers who grow genetically modified varieties cannot replant or trade them without paying royalties. It is a classic tale of corporate welfare. Publicly developed and supported universities are now, for a piece of the action, signing away to private entities material and intellectual property, paid for with tax dollars, that should be part of the public domain. What is wrong with universities working hand in glove with corporations to develop our food crops and getting a return on investment? One of the main issues is the ownership itself. Who owns wheat, for example? The food grain was first domesticated over 10,000 years ago in the Middle East. It is not native to this country and we would not be growing it here if we did not receive the help and genetic materials from farmers and public breeders worldwide. Private control of genetic materials is jeopardizing our food security. A second issue is the restricted flow of information. Because of developing ownership issues, most international breeders are no longer willing to share material. This is hurting research. Now, many of the products researched by publicly-funded scientists in public labs are being developed under confidentiality agreements and with strict limitations on publication. Some 50 percent of public breeders said they had been hindered in seeking exchanges of genetic material, according to a 1999 University of Wisconsin poll. Twenty-five percent reported having difficulty in graduate student training and research because of this limited access. New sources of genetic material are essential for agriculture, but private control of these materials is jeopardizing our food security. This is typical short-term gain over long-term investment. It is taking the value that is inherent in a university -- decades or centuries of continual research -- draining its value by exploiting current crop varieties, and moving on. One of the gravest dangers brought about by this approach is the abandonment of science that addresses true needs in favor of solving only problems that have proprietary or profit-driven answers. The government has pushed the academic-corporate partnership by not making grants available for research that could be privately funded. Meanwhile, university researchers proclaim genetically-modified crops are safe. These scientists, many of whom are openly earning extra money for their corporate work, are encouraged by their administrations. It's in the universities' financial interest to forge partnerships with corporations: thanks to a law passed by Congress, the Bayh-Dole Act of 1980, individuals and institutions are allowed to patent and profit personally from their publicly-funded research. Public breeders must be accessible and accountable to public scrutiny. In these times of vigorous debate on how our food is being developed and produced, we need programs that remain unbiased and responsive to the public's concerns. These programs are currently threatened by the rush to buy and sell genes, techniques, varieties and ideas. Return on investment is fine in the corporate world, but it is not a motto that should drive our public science. Stephen Jones teaches graduate courses in genetics at Washington State University, and has worked in wheat breeding for more than 20 years. and the subsequent passage of meat inspection laws. (April 23, 2002 - CropChoice guest commentary) – Opponents of genetically modified organisms (GMOs), unlike Sinclair, often aim squarely at the public's stomach by highlighting biotechnology's threat to public health. This has helped turn the tide against GMOs in North America and has routed them in Europe. But we should be making even more of an uproar about biotechnology's power to turn the code of life into a commodity. A farmer who buys a bag of Monsanto’s transgenic seed signs a contract that prohibits the saving of any seed harvested from the resulting crop. And if a plant breeder makes a cross with that variety to produce a new one - transgenic or not - Monsanto has a claim on it. It is as if an author compiled a thick novel entirely from the writings of other authors, added one original word, copyrighted the book, and then claimed ownership of each sentence individually. But farmers who buy Clearfield wheat or rice seed must sign a "Stewardship Agreement". The agreement is supposed to help farmers behave responsibly and prevent the evolution of herbicide-resistant weeds. But, conveniently for BASF, the measures it requires - no seed-saving, no use in crop breeding, and no use of any imidazolinone herbicide other than a BASF-branded one - all result in a bigger profit for the company. In fact - and here's the dark secret - no company would bother developing genetically engineered crops if the only results were improved field performance, better weed control, or high crop quality. Biotech companies invest in grain crops because they want economic control of all seed planted by the farmer, and of succeeding generations of seed. The widespread patenting of GMOs that followed was bad enough, but by legitimizing the vision of genes as property, biotechnology has fostered the patenting of non-transgenic varieties as well. Go look at the U.S. Patent and Trademark Office (USPTO) website. You'll find claims on naturally occurring DNA sequences that act as bookmarks on the plant's chromosomes, as well as the sections they mark. You'll find natural mutations that confer herbicide resistance like that of Clearfield varieties. You'll find dozens of non-transgenic soybean varieties and corn hybrids. Worst of all, varieties developed by the world's farmers through centuries of selection have been patented by American corporations or public institutions: yellow beans from Mexico, blue-fiber cotton from Central America, quinoa from South America, basmati rice from India, and many others. Andean farmers shamed Colorado State University into dropping the quinoa patent. The basmati patent, issued to a Texas company called RiceTec, was eventually overturned; however, RiceTec has since obtained patents on individual basmati varieties. All crop varieties - transgenic or not - owe their existence to plant breeders and farmers who were able to glean genes from a global pool of crop varieties, breeding populations, and wild species. By using patents to gain control of nature's genetic code, corporations and even publicly funded universities are attempting to dominate the market by shutting other plant breeders out of the gene pool, not by breeding a better product. This is a straightforward declaration of principle that should be firmly planted in international law - and soon. This morning, some of the DNA that landed in our stomachs at breakfast belongs to Monsanto. I don't know about you, but it's giving me indigestion. My university, like many others, is establishing a Life Sciences Institute to speed applications of new biotech research. The current academic understanding of how genes and proteins work together promises to lead soon to combinations of drugs that are customized patient by patient and to new therapies for inherited metabolic disorders. But getting these insights from the laboratory to the marketplace is apparently going to require universities to step up their collaboration with corporations, especially multinational pharmaceutical firms. This will represent an enormous structural change in academia, one whose supposed benefits ought to be studied with the same cultivated skepticism that is applied to scientific work. The century-old core of the academic life sciences consists of comparative anatomy, physiology and development of organisms, evolutionary history, environmental biology and systematics (the classification of living beings). It covers the patterns in living systems, from molecules through ecosystems, on time scales from microseconds to a billion years of evolution. The universities' primary job has been to organize this knowledge (in disciplines) and to preserve it (in libraries) so that details of any living creature -- past, present or to come -- might be embedded in the broadest possible explanatory framework. By building these theories, life scientists made genomics possible. But genomics deals with what works or doesn't work -- with machines and mechanisms. In the absence of theories wrestling with data -- the challenge that developed evolutionary biology itself -- genomic studies amount to mere technological puzzle-solving. They give back nothing to the intellectual world that spawned them -- nothing except market profit. In place of the collective search for ever-more powerful explanations, the new view of the life sciences would change the focus to proprietary craft knowledge -- knowledge that can be owned and held confidentially. This kind of knowledge has no proper role within the academy, an institution centered on the permanent curriculum of arts and sciences and traditionally unconcerned with secrecy -- or with capital gains. 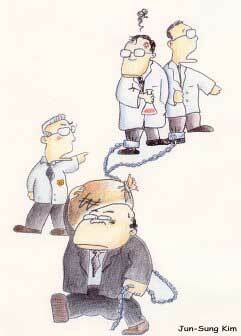 The mission of life science institutes emphasizes manipulation and control. Academic sciences, by contrast, are about understanding. For example, engineering colleges don't market civil engineering or automotive designs. They develop and strengthen theories about these things as they teach or criticize current practice. Similarly, universities are unlikely to be competent in generating and spreading market-oriented molecular knowledge. Their appropriate function is different. Within the domain of what the university knows well -- the enduring concerns of the growth, development and diversity of organisms -- we have one most critical assignment (after teaching). It is to determine and set forth what the consequences of current understanding will be for future scientific and social developments. In considering the areas where the life sciences institutes will concentrate their work, it is hard to avoid the conclusion that they will only heighten the contradictions at the root of contemporary Western medicine, with possibly disastrous consequences. For example, improving models of surgery, or new acute interventions for chronic diseases -- two domains of such institutes -- cannot deal with diseases of age, poverty, lifestyle, environment, overpopulation or evolution. The cost of "therapy" for one extremely premature baby would cover 10,000 pediatric immunizations. The cost of bringing forth yet another drug for springtime allergies could cover advances in tropical medicine that would prevent millions of premature deaths. Bodies vary one from another, and they fail and die. But the life sciences institutes arise from a "medicalization" of health that would deny this. They would perpetuate our overinvestment in an unending, unproductive extension of severely damaged lives. And they would exacerbate our appalling stratification by income and education and lead to an ever-increasing gap in quality of lives across the world. Whether they succeed or fail in their marketing efforts, life sciences institutes cannot help fostering the obsessions at the root of designer genes and pharmaceuticals. Concerns about a good life and a good death are replaced by unworthy fears for one's own body or one's own progeny. Encouraging this unhealthy philosophy of hazard-free perfection, with its implications of fetal selection, cannot be an appropriate academic activity. The cost of sacrificing familiar norms of scientific openness and disinterest to the "commodification of knowledge" -- to letting the market decide what is honorable scholarship -- hugely outweighs any scholarly benefit that life sciences institutes could provide to the academic sciences. The proper role for universities at a time of intellectual stampede such as the impending rush to the applied genomic sciences should be uncompromisingly skeptical. Centuries from now, one hopes, there will still be academics, who, when looking back on our time, likely will find our genomic data bases to be so many 21st century pyramids, wonderful in their meaninglessness. Now, more than ever in the history of biology, the role of the university must be to warn. The goals of today's life science institutes are economically, intellectually and academically incoherent. Universities need to return to their accustomed distance from economic fashions in the pursuit of knowledge and speak out against these developments, not embrace them in complicity. America's great universities should have nothing to do with the building of pyramids instead of life sciences. The writer is distinguished senior research scientist at the University of Michigan's Institute of Gerontology. (February 20, 2002 - CropChoice News) – Given the ongoing role that money plays in U.S. political life, it's hardly surprising that biotechnology companies contributed $633,850 to politicians at the federal level in the current and previous election cycles in the hopes of continued federal support for genetically modified crops. Monsanto, Aventis Crop Science, Archer Daniels Midland (ADM), and Cargill all broke records for donations in 2000, giving a total of $497,850 to politicians, political action committees (PAC), and political parties. Cargill and ADM led the donation pack. Cargill gave out $197,000 in donations – $47,000 to Democrats and $150,000 to Republicans. ADM gave out $202,450 in donations – $95,000 to Democrats and $107,450 to Republicans. Monsanto and Aventis CropScience were not all that far behind with $74,900 and $23,500, respectively. Members of the agricultural committees in the House and Senate were prime donation targets. One dollar in six went to a member of these committees, totaling $101,450 in the 2000 election cycle. While many received only a $500 or $1,000 donation, there were a few who seemed addicted to biotech bucks. The top three recipients were: Sen. E. Benjamin Nelson, D-Neb. with $16,000, Rep. Calvin Dooley, D-Calif. with $12,500, and Rep. Charles Stenholm (-TX) with $11,500. U.S. Attorney General John Ashcroft received $18,000 from Monsanto, ADM and Cargill toward what turned out to be a failed re-election bid. Not only did companies give generously, but executives also pitched in. Monsanto President and CEO Hendrik Verfaille has given out $27,500 over the past two election cycles to the likes of House Minority Leader Rep. Gephardt, D-Mo., Rep. Dooley D-Calif., U.S. Attorney General Ashcroft, President Bush and Sen. Hutchison (-AR), to name a few. The Chairman and CEO of Cargill, Warren Staley, has generously donated $13,550, including a $10,000 soft money gift to the Republican National Committee. Which PACs and which politicians have started the 2002 election cycle off early and have tapped into the financial resourses of Monsanto, Aventis, ADM, and Cargill? While actively seeking funds does not begin until late spring and early summer, Sen. Max Baucus, D-Mont., has raised $10,000 from just these four companies. Sens. Tom Harkin, D-Iowa, and Sen. Pat Leahy, D-Vt., have received $9,000 and $7,000 respectively. With ADM having already given out $109,000, the 2002 election cycle is looking like biotechnology and agribusiness companies will continue their push to influence agricultural policy. The most active GM advocate is expected to be John Ashcroft, the proposed attorney general, who received $10,000 from Monsanto in the recent elections, the most the company gave to any congressional candidate. Mr Ashcroft led calls to the Clinton administration to promote GM crops in developing countries and to persuade Europe to accept them. Mr Thompson is a GM supporter and has accepted money for his campaigns from Monsanto. He used state funds to set up a =A3200m biotech zone and was one of 13 state governors to launch a campaign, partly funded by Monsanto, to persuade Americans of the benefits of GM crops. Ann Veneman, the new agriculture secretary, was a director of the GM company Calgene, now owned by Monsanto, and has been active in world trade talks which would favour US companies exporting GM crops to developing countries. Charles Lewis, director of the Centre for Public Integrity, said: "It looks like Monsanto and the biotechnology industry have the potential to bring undue influence on the new government." Genentech, Inc., . . .now chief domestic policy advisor to Al Gore, Vice President of the United States. Linda J. Fisher . . .former Assistant Administrator of the United States Environmental Protection Agency's Office of Pollution Prevention, Pesticides, and Toxic Substances, . . .now Vice President of Government and Public Affairs for Monsanto Corporation. L. Val Giddings . . . former biotechnology regulator and (biosafety) negotiator at the United States Department of Agriculture (USDA/APHIS), . . .now Vice President for Food & Agriculture of the Biotechnology Industry Organization (BIO). Marcia Hale . . . former assistant to the President of the United States and director for intergovernmental affairs, . . .now Director of International Government Affairs for Monsanto Corporation. Michael (Mickey) Kantor . . . former Secretary of the United States Department of Commerce and former Trade Representative of the United States, . . .now member of the board of directors of Monsanto Corporation. Josh King . . . former director of production for White House events, . . . now director of global communication in the Washington, D.C. office of Monsanto Corporation. Terry Medley . . . former administrator of the Animal and Plant Health Inspection Service (APHIS) of the United States Department of Agriculture, former chair and vice-chair of the United States Department of Agriculture Biotechnology Council, former member of the U.S. Food and Drug Administration (FDA) food advisory committee, . . . and now Director of Regulatory and External Affairs of Dupont Corporation's Agricultural Enterprise. William D. Ruckelshaus . . . former chief administrator of the United States Environmental Protection Agency (USEPA), . . . now (and for the past 12 years) a member of the board of directors of Monsanto Corporation. Lidia Watrud . . . former microbial biotechnology researcher at Monsanto Corporation in St. Louis, Missouri, . . . now with the United States Environmental Protection Agency Environmental Effects Laboratory, Western Ecology Division. *Margaret Miller, Michael Taylor, and Suzanne Sechen (an FDA "primary reviewer for all rbST and other dairy drug production applications") were the subjects of a U.S. General Accounting Office (GAO) investigation in 1994 for their role in the U.S. Food and Drug Administration's approval of Posilac, Monsanto Corporation's formulation of recombinant bovine growth hormone (rbST or rBGH).The GAO Office found "no conflicting financial interests with respect to the drug's approval" and only "one minor deviation from now superseded FDA regulations". (Quotations are from the 1994 GAO report). WASHINGTON DC More than a ton of StarLink corn dumped at EPA headquarters today provided a welcome mat for Christine Todd;Whitman, just starting her new job as head of the agency, and a reminder of the genetic food fight that is waiting her attention. A dozen Greenpeace activists dressed in biohazard suits and holding a banner reading, "Genetic Experiment - Whitman: StarLink Corn Isn't Food!," piled the gene-altered corn in the Environmental Protection Agency's driveway to underscore the group's demands that the agency not approve the animal feed crop for human food. Scientists have warned that the altered corn could trigger dangerous allergies in some people, with children at greatest risk. In a move that signals a continuing revolving door between regulators and the biotech industry, Whitman is expected to name former Monsanto executive Linda Fisher as Deputy Administrator of EPA, according to today's Washington Post. Fisher is just the latest genetic engineering crony to be added to the Bush administration, which already includes at least four others with ties to Monsanto. "The Bush Administration is shamelessly handing over our food to the gene giants," said Charles Margulis, Greenpeace Genetic Engineering Specialist. "Christy Whitman is known for favoring dirty industries over scientific precaution, and with Monsanto attached at her hip, we're sure to see more genetic food pollution." The American Chemical Council (ACC), a trade group that includes the major producers of engineered crops, has already reacted warmly to the Whitman's appointment. According to Chemical Week, ACA President Fred Webber "is optimistic about the appointment given Whitman's record in New Jersey." Even before her confirmation as the new EPA chief, Whitman called Webber to express her desire to work together with the industry. ACC has good reason to be optimistic. The former New Jersey Governor has a reputation, even among her own agency staff, for being soft on polluters. According to a 1997 survey of over 700 New Jersey Department of Environmental Quality staffers, enforcement of environmental laws under Whitman was marred by "excessive corporate influence and manipulation of scientific findings." The survey, conducted by Public Employees for Environmental Responsibility (PEER), found that more than half of the environmental staffers felt that "scientific evaluations are influenced by political considerations" under Whitman. Since last fall, nearly 300 food products have been contaminated with StarLink corn. EPA approved StarLink only for animal feed, and required Aventis, the developer of the corn, to insure that the corn is used only for feed. EPA officials have stated that Aventis illegally allowed StarLink to contaminate the food supply, but the agency has never indicated that it would enforce its rules against the company. "Christy Whitman has been cozying up to the chemical and biotech industries while environmentalists and consumers are left holding the feed bag," said Margulis. "Wealthy companies should not be granted pardons, they should be held accountable for polluting our food." As the largest category within the US soy crop, GM varieties are the principal beneficiary of huge subsidies now being paid by the US government to its soy farmers. According to the Farmers Weekly report below a staggering figure of nearly 70% of US soy bean value now comes from the US government. This has caused a 25% increase in soy planting in the US since 1998, and a consequent collapse in world oilseed prices. In the process the US government has created an artificial domestic and international market for US soy, the world's largest source of genetically modified food and animal feed. In effect US farm subsidy policy is artificially promoting GM production at the expense of other non-gm oilseeds grown around the world which do not receive similar levels of subsidy. From this it is clear that the US's commitment to free world trade in the agricultural sector is something of a fraud, and EU (i.e in practice non-gm) oilseed producers are now threatening to take the US to the World Trade Organisation unless subsidies to US soy bean growers are cut. If such a challenge were successful the competitive position of the world's largest genetically modified crop is likely to be considerably reduced. "I will put the maize under government loan. That way if this [starlink GM corn] problem get worse I can just dump it on the government next year and say you guys created this monster; you clean it up." US farmer and GM seed salesman, Nebraska, (Farmers Weekly, 7 December 2000). Meanwhile it would appear from these experiences that 'free-trade' in agricultural products means at least two things to the American Government : forcing consumers to buy things they don't want providing large taxpayer revenues to produce those things in the first place. It would seem that the command economy model did not die with the Soviet Union. Answer: When it is dressed up as a marketing loan and paid by the US government. Despite its 1996 Freedom to Farm Act, the US has been remarkably adept at getting extra cash into producers' pockets. As the newly-formed European Oilseeds Association points out, almost 70% of the soya bean value now comes from the US government. That compares with just 30% to EU oilseed growers. So US claims that it has not distorted competition are looking increasingly shaky. At a time when prices have been falling, soya production has rocketed the opposite to market expectations. That cannot be allowed to continue. The EU commission should redress the balance, either by paying our oilseed producers more, or by taking the US to the World Trade Organisation in Geneva.